Middletown, OH, August 18, 2018 — Elsie V. Hightower, an entrepreneur and vanguard who stood at the forefront of minority advancement and progress found peace in heaven on August 9th 2018. A savvy Entrepreneur and Businesswoman, Elsie and her husband Yudell Hightower, co-founded Hightowers Janitorial Service Inc. in 1956. It became one of the communities early black owned businesses employing thousands of local Middletown employees over her tenure as VP and Secretary. After arriving to Middletown, she obtained her GED, and attended Middletown Business college, New York Technical Institute and a 2-year program at Miami University. In addition to her duties at “HJS” she worked at Filsons, McAlpins, Avon Products, Middletown Mental Health, Packaging of America, Armco and International Div. A High school basketball player, became a champion bowler in Middletown. She was active in the Civil Rights movement and advocated for employment in Middletown and equal education. She and her family broke many racial barriers in Middletown when they moved to the east end of town in 1967 crossing the “red Line” of housing discrimination and ultimately integration of the schools in the east end. She was on the front line of many racial and community challenges; her lifetime of work impacted entire communities. It was through her early engagement as a co-owner of Hightowers Janitorial Service that started the legacy family business, Hightowers Petroleum Co, www.HightowersPetroleum.com. 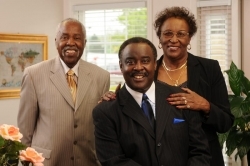 To date, three generations of Hightowers have been central to the company’s success – running and operating the flourishing energy supplier, one of the largest African American privately held businesses in the country. Elsie was born on June 7th 1935 in Eupora, Mississippi. She was married for 66 years to her sweetheart Yudell Hightower and together they had 5 children, Donnie Hightower (deceased), Stephen L Hightower (Bernita), Kenneth Scott Hightower, Barbet Hightower (deceased) and Yolanda Fay Hightower. Nine Grandchildren, Quincy SL Hightower, Stephanie L Hightower Thomas (Julius II), Sabrina L Hightower, Stephen L Hightower II, Dominique D Hightower, Jason AL Hightower, Austin K Terry, Kip Keno Hightower and Angel N Howard. She also leaves her special brother Homer Lee Robinson and six Great-Grandchildren Quincie SL Hightower, Jadlynn M Thomas, Jasmynn M Thomas, Jarrenn M Thomas, Stephen L Hightower III, Alaysia Howard and Ayson Terry. Her body has been donated to Wright State University for Science. A memorial for Elsie will be held at Breiel Church, located at 2000 N. Breiel Blvd. Middletown, Ohio 45042 on August 25th beginning at 3:00 PM – 6:00 PM. Any acknowledgements of sympathy can be directed to the Hightowers Petroleum Co family office located at 3577 Commerce Drive, Middletown, OH 45005; please attention to Denise Paige.